‘Constantia Fibre’ is an initiative to bring super fast fibre Internet to the Constantia Valley and are represented by the Constantia Property Owners Association, Constantia Watch, Nova Constantia Crime Watch, Constantia Hills Community Watch and the Strawberry Security Association. Fiber to the home , also abbreviated as “FTTH”, is the installation and use of optical communication fiber cable from a central point directly to individual residences, apartment buildings and businesses to provide unprecedented high-speed Internet access. FTTH dramatically increases the connection speeds available to computer users compared with technologies currently in common use. If you have not yet registered, please take a minute to do so at www.constantiafibre.com/register as maximum support is required for this project. The registration is non-binding and simply allows the community to gather interest before talking to fibre service providers. Spread the word to your neighbours and friends – and encourage them to register on the site. The more registrations Constantia gets, the quicker the potential roll-out will happen. The Constantia blog and Chas Everitt are happy to bring you the key information for the ICC Cricket World Cup 2015, including dates and times for every fixture in Australia and New Zealand. The tournament will be jointly held across Australia and New Zealand in February and March 2015. The first matches will be played in Christchurch and Melbourne on 14 February, with the final at the Melbourne Cricket Ground on 29 March. Soil For Life will be holding an Open Garden this Saturday 7 February 2015 from 9am-3pm. There will be a mini-market, with bountiful organic produce and garden supplies for sale and artwork on display. Soil for Life is a Cape Town-based non-profit organization teaching people how to build the soil and grow healthy plants, so that families can sit down to plates of safe, fresh nutritious food, all year round. Their tranquil HQ in Constantia is the site of a beautiful working food garden and if you haven’t yet visited, this weekend is definitely a good time to start. When: Saturday 7 February 2015. 9am-3pm. R10 entry. From town: Heading along the M3 towards Muizenberg take the Ladies Mile exit. As you come off the motor way you will come to a set of traffic lights. Turn left at these, and then at your next set of traffic lights go left again in to Spaanschemaat River Road. Go down the hill and at the bottom of the hill on your right you’ll see ‘Peddlar’s on the Bend’ (a restaurant), immediately after Peddlar’s turn right (on the corner of Peddlar’s) into a dirt road. On the left will be a metal fence and the Waldorf School, go down this road until you see the stables. 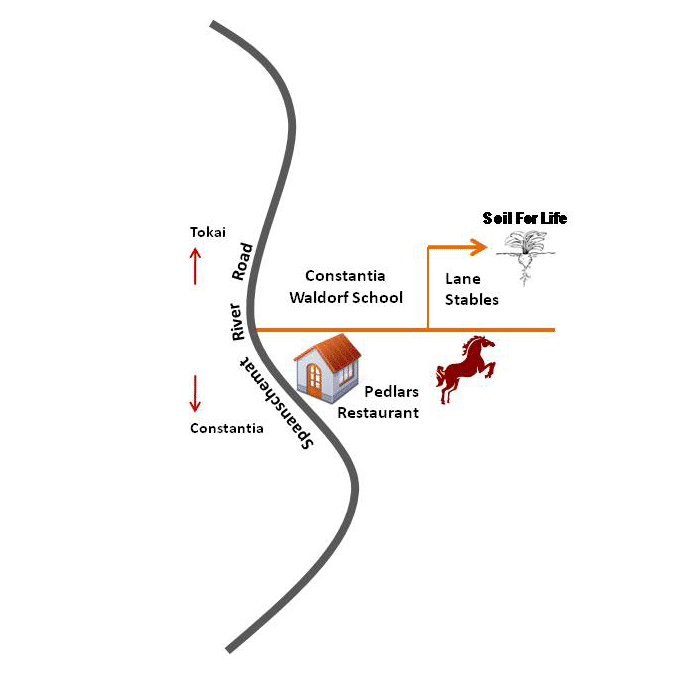 Just after the school and before the stables turn left and follow this road right round the back of the stables to the end and you’ll be at Soil for Life. From Peddlar’s there are signs to Soil for Life.